This week, I will not highlight a restaurant, but rather an assortment of different and delicious street foods, which at the same time could double as a cost-effective alternative to your local chain grocery store — especially when in the need for fresh produce. Picture tropical dragon fruit, massive avocados, watermelon, juicy tomatoes, tree-ripe bananas, the list goes on and on. Most towns around Costa Rica will have their own version of this at some point throughout the month. In Escazú, it happens every Saturday from 5 a.m. to 1 p.m. 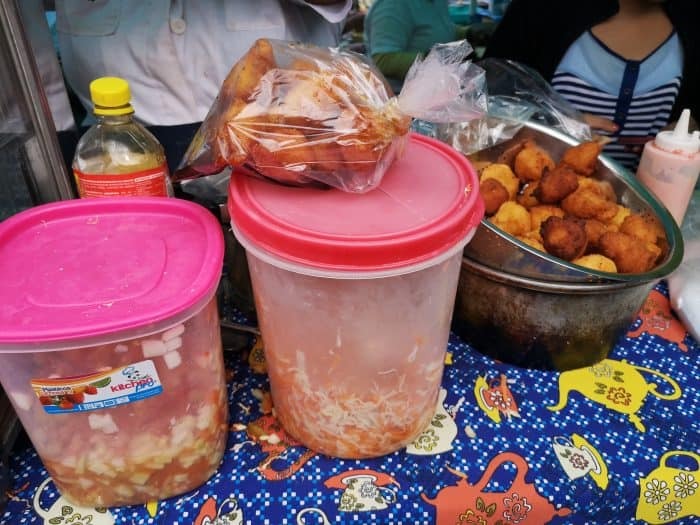 I am talking about the farmers market, which takes place along Avenida 32, just south of the public park and Catholic Church grounds, in the very center of Escazú. The street is closed off to vehicles, making for a nice pedestrian passageway lined on both sides with a large offer of different products from an interesting mix of local farmers and craftspeople — all of whom have come here to peddle their goods to curious shoppers, like me. I walk up and down the market browsing from stall to stall, noticing different things each time I pass. I usually go with no shopping list or intended purchase but end up leaving with a variety of different goodies I didn’t know I needed (but did). And, as I am a creature of habit, I usually end up repeating the same couple of vendors. Experience stunning wildlife in a tropical rainforest with Costa Rica Vacation Rentals. As you would find at a farmers market anywhere else in the world, here in Escazú there are many different fresh fruits and vegetables being sold, direct from the grower, as well as free-range eggs, wild honey, natural medicines, seafood, meats, breads, crafts and even prepared foods – hot and ready to eat. As mentioned, prices here will definitely beat the usual grocery store options, so if you are into juicing, or daily smoothies, this is the place to go to stock up. Believe it or not, I don’t cook too much at home, although I love to, so I leave most of those booths untouched. I skip the crafts and trinkets, too, after having some fun browsing them. 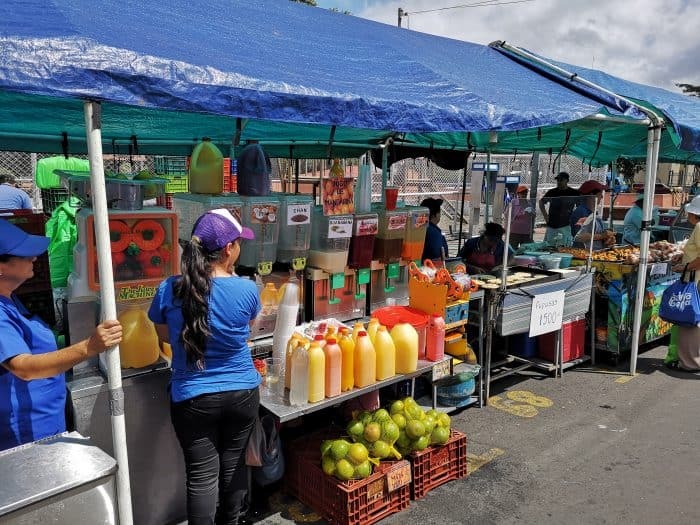 What I really want is an ice-cold coconut water or a fresh-squeezed sugarcane juice, or perhaps an artisan coffee from Don Pulpo, who grow their beans just a few kilometers away in Salitral, Santa Ana. All of which are available at the Escazú Farmers Market. After I’m all jacked up on sugar and caffeine, I like to stop by one of the last stalls on the west end of the market, to buy empanadas and buñuelos. These are supposedly to take home – but usually end up being devoured during the drive, before I get there. You can recognize this stall by its glass display case of various fried goods, mostly empanadas, and the group of women dressed in all white working to satisfy the lineup of customers. One served the foods and another received the cash money. In a bowl on the table, covered by a bit of plastic to keep the flies off, you will find the buñuelos. I think they cost around 150 colones each, but I can’t be sure. I just give the lady 2,000 colones (about $3.35) and tell her to load me up. In return I get a plastic bag full of more than a dozen of this tasty take on a fried donut ball hailing from Nicaragua (though many countries have their own versions). These ones are made from a dough of yucca and cheese fried in hot oil. It might sound weird, but it works, and they are a treat for the sweet tooth. Make sure you ask for them to pour the molasses like syrup on top of the buñuelos before you go. Trust me. 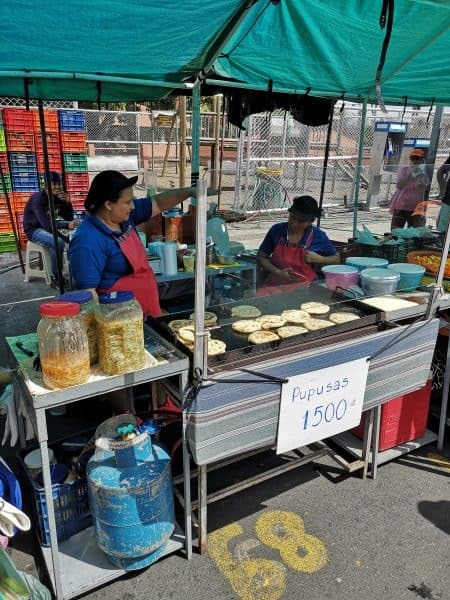 Another not-to-skip stall is the pupusa ladies, who you can’t miss frying up the El Salvadorian delicacies. Made from cornmeal and stuffed with things like mashed beans and melted cheese, you have a choice of different shredded and lightly pickled cabbages to top yours off with. One is mild and the other had a bit of heat. Opt for the spicy one and it adds a great kick, as well as some refreshing crunch. Try one and I bet you will be craving them every Saturday thereafter. It’s nothing to be ashamed of. They’re cheap, too, so why not? In addition to the foods, you can find flowers, spices, clothing, and a pet fish for your aquarium, if you have one. Seriously. It is a great mix of vendors, so even if you have no intention of buying anything, you can still go, just for fun, as a different way to spend a morning. They do occasionally have live music, too, which is always entertaining. I have seen a man playing an acoustic guitar, as well as a group playing a traditional wooden marimba. Both were very talented artists, and I was happy to tip a 500-colon coin into their recipient — a little less than $1 for a greatly appreciated performance. Hungry for a trip down to Costa Rica? Download the Skyscanner Android app to find the best price on flights. The Farmers Market in Escazú takes place rain or shine, but I recommend going when the weather is nice. From their location, you can enjoy the green tops of the mountains up above San Antonio de Escazú as a beautiful backdrop, while people watching and sampling a variety of exotic and unique offerings. All while getting to have small talk with the people responsible for making or growing it, and saving some money while you’re at it. I would also recommend arriving before 11:30 a.m., as many stalls begin to sell out and shut down early. After browsing the market, grab a seat in the neighboring park, or enjoy the architecture of the adjacent Catholic Church. Which for me, is the center of old Escazú in all of its charm. Surprisingly, you can search “Feria de Agricultor de Escazu” in Waze or Uber to arrive conveniently. 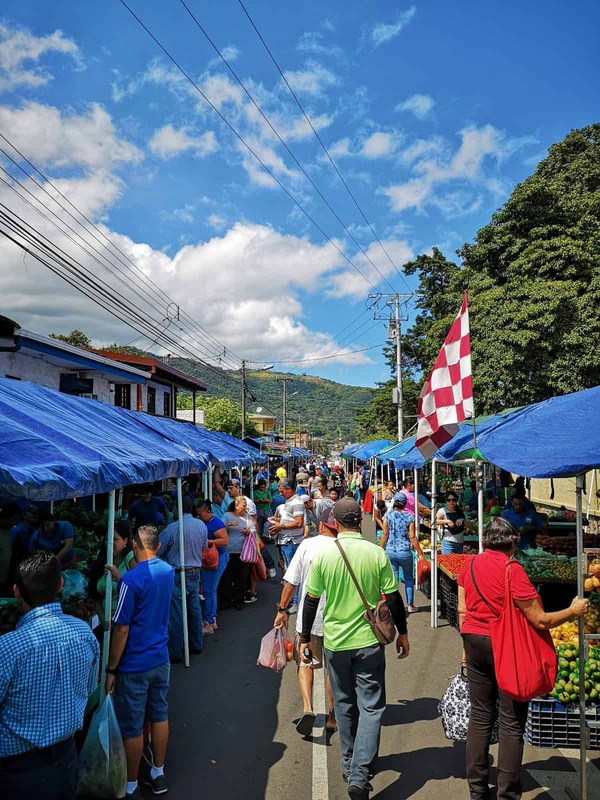 Or go here to find locations and times for other farmers markets throughout Costa Rica.